Jennifer is a creative London-based photographer specialising in food and travel photography. So I decided to start day one like a real Singaporean with a kaya toast breakfast. A trip to Singapore would definitely not be complete without it. The simple yet strange-sounding dish is comprised of toast spread with kaya (sweetened coconut) jam, which you then dip into a soft boiled egg seasoned with soy sauce and white pepper. It sounds odd, but believe me it is truly addictive! What makes the city’s cuisine interesting is the fusion between Indian, Malay and Chinese cultures, which are present in every aspect of Singaporean life as well as in its food. On the journey to Little India, I tried to get tips on where to eat from a friendly taxi driver. The best reply I received was ‘look for the busy stalls – the bigger the queue, the better the food’. Little India is a very bubbly and lively place, especially during breakfast time and at weekends. Stalls sell all sorts of food, but I opted for a banana leaf filled with rice, different vegetable curries and pickles with a roti canai – an Indian-Malay flatbread – on the side. Strolling through the streets of Little India, watching the locals walking and chatting outside the various spices and hardware shops, was a great way to spend a few hours before I slowly headed towards Chinatown. Chinatown is very pretty, with colourful houses and lanterns of the old red light district, but I was here for the food. I visited the Maxwell Food Centre which is home to a very famous vendor called Tian Tian. This stall sells Hainanese chicken rice, one of the highlights of Singaporean street food. It is a slow-poached chicken accompanied by rice cooked in chicken stock with a ginger and garlic dressing and an extremely fiery chilli sauce. I also paid the Old Airport Road Food Centre a visit after overhearing locals singing its praises. After looking at what everyone else was eating (and doing a bit of Googling to find out how to ask for them) a few dishes stood out: Chinese-style rojak (a mix of fruits and vegetables in a spicy, savoury sauce), curry puffs (pastry parcels containing spiced potatoes) and carrot cake, which is actually a savoury fritter made from white radishes rather than the sweet cake of the same name baked in the UK. I ordered a carrot cake and a curry puff and join a group of locals on a shared table. With the countless vendors and hawkers across Singapore, there's a simple way to find the tastiest food – join the longest queues you can find! Afterwards, I walked through the lovely district of Geylang towards a restaurant renowned for serving the best laksa in town: 328 Katong Laksa. Their laksa is tasty, rich and full of coconut, with prawns, cockles, rice noodles, beansprouts, fishcakes and a very spicy sambal chilli paste. A long walk took me to the beautiful Gardens by the Bay, an iconic part of the Singaporean skyline. Walking around this beautiful part of the city started to get my appetite going again, so I decided to pop into Satay by the Bay for a few satay skewers. This is a modern hawker centre located in the gardens, but satay is not the only food served and options are fairly vast. I watched the light show begin with a full stomach and was happy. After a good rest on my third day in Singapore, a few friends decided to join me for breakfast. We headed to Geylang Serai Markets – a hidden gem off the tourist track – to taste some authentic Malay food. Following the rule that the longest queues will result in the tastiest dishes, I stood in line for a plate of nasi padang – steamed rice with a combination of different dishes on the side. While I was waiting my turn trying to decide what ingredients to choose, a few locals gave me some suggestions as it was clear I didn’t know what to go for. After saying a few words in what I hoped was Malay, my delicious plate was served with a smile. My last stop was just a quick walk from Geylang Serai down a residential road, to a shop called Kway Guan Huat Joo Chiat Popiah. This is where you’ll find freshly made popiah – a rolled crepe stuffed with vegetables, full of fresh and light flavours. 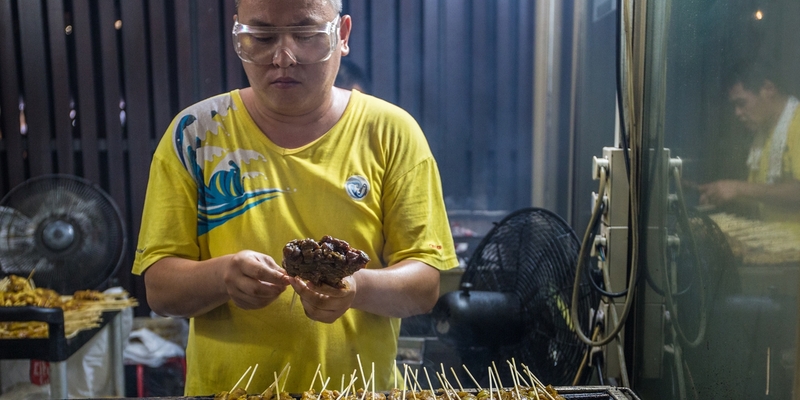 Eating in Singapore completely changed my perceptions of the city. I saw so much character and authenticity there and felt like I’d travelled through several different countries whilst staying in the same place. You could easily spend every single day eating out and never get bored of the food. What better reason to visit Singapore!